In the 1980s FM led the development of another new technology: early suppression fast response (ESFR) sprinklers. This new class of sprinkler was developed to ensure a higher ADD than RDD, while providing hazard protection with cartoned plastic commodity storage as high as 7.5m under a 9m high ceiling. ESFR sprinklers are designed to respond to a fire at its early stage of development and to discharge a large quantity of water over the fire to achieve fire suppression. The first generation of ESFR sprinklers has a nominal orifice diameter of 18mm and a K-factor of 20.25. ESFR technology became enormously popular, protecting storage of ordinary combustibles (class I – IV commodities and cartoned unexpanded plastic). In the 1990s, the K20.25 ESFR sprinkler quickly became the most popular technology for storage protection. Shortly after the introduction of the K20.25 ESFR sprinklers, there was a strong desire to use ESFR technology for protection of greater fire challenges, as a result of greater ceiling and storage heights, which were beyond the original intended protection objectives of the K20.25 ESFR sprinkler. Within the next ten years, ESFR sprinklers with larger K-factors, such as 24.3, 32.4 and 36.8 were developed to provide protection for these greater fire challenges. As was expected, the larger the orifice, the larger the drops delivered by the sprinkler. The K36.8 ESFR sprinkler was primary developed for protection of 13.5m high warehouses with storages of cartoned plastic commodities up to 12m high. Beyond ESFR, storage sprinkler classifications were further expanded to include Control Mode (Density/Area) [CMDA] and Control Mode (Specific Application) [CMSA]. CMDA is a system design method based upon the calculation of the density of water discharged in a specified area of coverage. This approach is limited to ceiling heights of 7.6m. 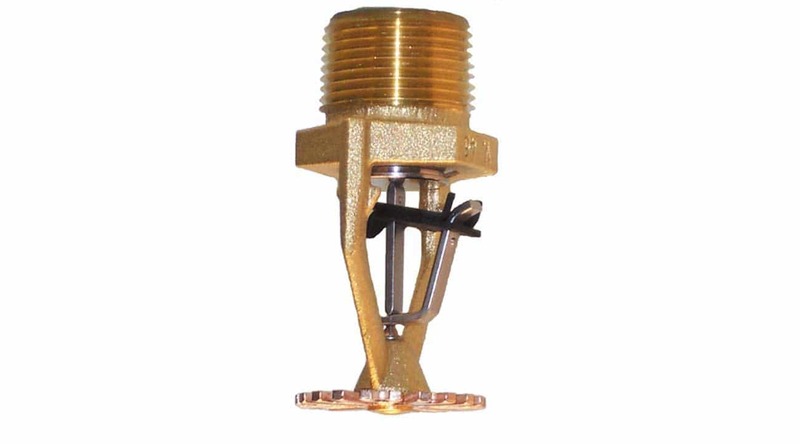 K-factors of Control Mode sprinklers include K8.1, K11.5, K16.1, K20.25, K24.3 and K36.8. With increasing K-factor and orifice size, there is an established increase in coverage as expected. CMSA sprinkler systems are designed to provide a minimum number of sprinklers operating at a minimum pressure for a specific occupancy. The large-drop sprinkler is the first CMSA sprinkler. After creation of this class, other CMSA sprinklers with larger K-factors of, 24.3, 28.3 and 36.8 were developed. A series of fire tests concluded that the standard-response K36.8 sprinkler can be as effective as ESFR sprinklers in providing protection for storages in warehouses with ceiling height up to 12m. Today, system designers and contractors typically associate adequate sprinkler suppression performance of rack storage fires only with fast-response sprinklers. Although a fast-response sprinkler responds to a fire sooner than a standard-response sprinkler (making it easier for water drops to penetrate the fire plume and reach the burning fuel), fast response alone is not the necessary and sufficient condition for a sprinkler system to achieve fire suppression. More importantly, it is the condition where ADD is greater than RDD. In this situation, superior fire suppression can be expected. Aided by the scientific principles of studying sprinkler performance in storage fires, a new large K-factor standard-response sprinkler has been developed which can now achieve fire suppression of cartoned plastic commodities under a ceiling up to 12m high. The sprinkler model is a pendent sprinkler with a nominal 25mm diameter orifice and a K-factor of 36.8. The sprinkler temperature rating is 71°C, and the sprinkler has a Response Time Index (RTI) of (72m/s). The large water drops generated from this large K-factor sprinkler enhance its penetration ability against the fire plume. A series of fire tests concluded that the standard-response K36.8 sprinkler can be as effective as ESFR sprinklers in providing protection for storages in warehouses with ceiling height up to 12m, since both the ESFR sprinklers and the new sprinkler were evaluated with the same fire scenarios. Based on the performance of the new sprinkler, FM Global has treated the sprinkler in the same fashion as the ESFR sprinklers, requiring a 12-head design for the system water demand, identical hose stream demand and water supply duration. The same sprinkler installation rules with regard to physical obstructions and ceiling elements are applied to both the ESFR pendent sprinklers and the new sprinkler. However, the new sprinkler is classified not as an ESFR sprinkler but as a CMSA sprinkler, because the sprinkler does not use a fast-response link. This type of technology can offer a significantly reduced end-head pressure compared to traditional ESFR technology and is poised to replace ESFR as a design choice in storage applications. A low end-head pressure system reduces discharge pressure requirements by 25-40% for 9-12m ceilings and 25-70% for ceilings that are up to 9m in height compared to traditional ESFR products using FM Global data standards. A benefit of the reduced end-head pressure of this new storage sprinkler is the opportunity to reduce pipe diameters in branch lines and cross mains and to potentially eliminate the need for a pump if the public water supply is strong enough, affording significant cost savings in material and labour. The broad range and increasing sub-categorization of sprinkler types have made for a confusing palette of fire protection solutions. Complex installation guidelines for each class of sprinklers further complicate the design landscape. In updating its data sheets that specify the rules for the design and installation of storage sprinkler systems, FM Global is seeking to simplify the variations in sprinkler classes. The goal is to base the system design rules on performance of the sprinkler and not on the traditional description of the sprinkler type so that greater consistency in system performance can be obtained. The fire suppression or control performance of sprinklers depends on the combined effects of the sprinkler attributes: sprinkler orientation (pendent or upright), sprinkler deflector design for generating the desirable spray pattern, volume median diameter of the spray, sprinkler sensitivity (RTI) and temperature rating. It is these parameters – that predict the performance of a sprinkler system – that govern FM Global’s design rules rather than the traditional name associated with the sprinkler. As storage space design continues to evolve, new technologies continue to be introduced into the marketplace to meet increasing challenges. Simon Ouellette is Engineering Services Supervisor at Victaulic.